Week 5 saw the Royals go 4-2 with a sweep of the Red Sox and a 1-2 series with the White Sox. Jackson showed his first signs of coming back to Earth with his first sub .300 BA week in some time. Cabrera picked up the slack for him though, hitting well over .400 this week. Minor finally had a strong start...and picked up a no decision. Talk about a guy that just needs a W.
The bullpen didn't blow any leads this week that led to losses, PROGRESS! Weird stat...even with 7 blown saves, the Royals are undefeated to this point in the season when leading after 7 innings. Obviously that won't hold up all year, but it's a cool thought! Week 6 is in the books! The Royals dropped both games of a two game set against a Rangers team that may be starting to find its stride. Harrison and Bumgarner pitched great games, both spinning Quality Starts, but the Royals dropped each game by one run. Next it was home to face Baltimore, in a series that probably should have been decided by who could blow more saves. As it stood, the Royals escaped with a split, eeking out a win in the bottom of the ninth, 1 out, 3 run home run by Jesus Guzman. The Diamondbacks came to town to end the week, and the Royals took two of three from the Diamondbacks, losing one game in extras. The Royals lost two pitchers this week...both on grounders to short. I'm not sure if Murphy is trying for the old 6-1-3 put out and just forgot to give the heads up to the pitcher - or what it is - but happily, Harrison is only going to miss one start. Week 7 and 8 get jammed into one update for the Royals. Over the course of both weeks, the Royals swung a .500 record at 6-6. It was a frustrating couple of weeks for the GM, as the Royals were held to 10 runs in the final 5 games of week 7 after putting up a 10 spot in the first game and still finding a way to grab a loss. A relatively injury free start to the season saw two pitchers go down during the course of the week. Week 8 started as badly as week 7 ended, with two losses to the Indians, who've really just had the Royals number in the early part of this season. Matt Harrison righted the ship with a beautiful 4 hit shutout of the Indians in the series finale. The team must have gotten a little spark from that start, because the Royals then welcomed DMBO's hottest team - the Athletics and their 10 game win streak - into Kauffman stadium and promptly swept them. This was a tough call between two players who've had strong opening months. Both Brett Jackson and Scott Rolen have had outstanding starts to the year, but at this point, I think you have to give the nod to Rolen. Rolen leads the team in OPS, 2B, 3B, HR, and RBI. For a guy in the twilight of his career, he's doing his best to remain relevant. Hopefully, Jackson's best years are in front of him, and he's certainly turned in an outstanding first couple of months as a rookie - he leads the team among qualified players in BA, OBP, and Runs Scored - but I think you have to really admire and applaud the season Rolen is putting together. This was a real no-brainer. Ellis has been nothing short of spectacular defensively for the Royals this year. He's tied for third among qualified 2B in all of DMBO with a .996 fielding percentage. He's amassed 242 chances and has started all but one game for the Royals this year. Another tough choice as Madison Bumgarner and Matt Harrison both put together okay campaigns over the first two months of the season. Harrison gets the nod, though, if for no other reason than his most recent complete game shutout. Both pitchers have been better than their records show, but Harrison's sub 3 ERA - while a somewhat outdated stat - does show a little bit about his good pitching this year. His WHIP is a little high, but if he can keep his H/9 below 8 as a starter, he should start to see better results in the win column! Things have been looking up for Bumgarner in every column except the win column recently, and his luck is bound to change there. His last four starts have all been strong, and while the Royals have gone 2-2 in those starts, both losses were attributed to blown saves. He and Harrison should make a strong 1-2 punch for the Royals going forward. Can his stock really get any lower??? Look for journeyman Jack Wilson to get some starts at SS for the Royals. Not only does Wilson represent an upgrade at SS defensively, but Murphy's season has been so bad offensively to this point that Wilson's bat may well represent an upgrade. It's the Aroldis Chapman version of Hamlet's soliloquy. The cuban fireballer has been a starter in Cuba, a middle reliever in the big leagues, and now a closer in the big leagues. What does it all mean? INQUIRING FANTASY AND SIM OWNERS WANT TO KNOW! Let's be honest, the guy has tremendous value, and his real life season has me salivating...to a point. I'd much rather he be awesome and a starter, as top notch starters are really, REALLY hard to find. However, can a guy really complain about having a closer who - with one day left in May - has a ZERO earned run average and a WHIP that's smaller than what a 12 oz. coke costs in most places? The Royals can't have lost out on that trade that badly, can they?! Hopefully not. A closer look at some of Morrison's stats helped the GM back away from the ledge just a little. Morrison's K rate is actually a little below his career norm to this point in the year, and his walk rate is pretty close to his career norm. His wOBA is still hovering just above .300; and while his 2RC+ is below 100 for the first time over a significant time frame in his career, his BABIP is nearly 30 points below his career average. On the fielding side, there is hope for an AV range rating at 1B in the future. While that would be helpful, everyone in Royals land has one thing on their mind...GET THE REAL LIFE BAT GOING. Fortunately, the peripherals are on his side. Hopefully things will start to normalize soon. I'd be thrilled to get LoMo back if you ever give up on him. The price would obviously be different, but I think we both would agree that the bat has the potential, still, to be quite special. I think for the price I paid it would take a lot for me to give up on him. That being said, I was pretty down in the dumps about him until I started doing some research into the peripherals. I'm hopeful he just has a big second half to balance the year out. After the first half of the 2012 season, the Royals are playing a little under expectations. The team is 13 games under .500 and has some work to do to end the year in the 75 win range. That said, there are still been some good things happening in KC this year. Brett Jackson is still keeping up his hitting ways, leading the team in average, runs scored, and stolen bases, while sitting second on the team in on base percentage and triples. Rolen continues his renaissance, putting up an .847 OPS while playing stellar defense at 3B. Rolen leads the team in doubles, home runs, runs batted in, and slugging percentage. The offense is still in the top of of the AL in batting average and on base percentage, but it lags behind in slugging percentage. Without the big hits, the Royals are one of only four teams in the AL to average less than four runs per game over the 1st half. On the pitching side, Matt Harrison is still having a great year. He's put up a sub 3 ERA through the first half and is the team's only starter with a winning record. Along with Harrison, Bumgarner has put up 12 quality starts this year. Hopefully, these two pitchers will anchor the staff for years to come. Strangely, the team's pitching still sits in the top half of the AL in ERA (though just barely). However, WHIP against and OPS against show too many walks and too many big hits tend to do the team in. Overall, I still think this team has the potential to hit 75-77 wins, but it's going to take one heck of a hot streak to get there. As the season moves into September, a look at the standings shows that the Royals have zero chance to make the postseason. That being said, let's take a look at how the Royals look going into the offseason and 2013. 1B: Logan Morrison, Mat Gamel, Jesus Guzman - Things are a little uncertain at 1B. Gamel and Morrison are having good sims, but Gamel has been out most of the year in real life and Morrison hasn't played since July 28th and really had a rough year at the plate. Guzman is nothing more than a utility player at this point. Forecast: Gamel and Morrison need to have good ZiPS ratings if the Royals hope to have any offensive pop next year, but at this point, an AV rating at 1B will get you time playing defense while the other will see DH duties. 2B: Mark Ellis (Option) - The Royals have a tough decision to make here. Ellis is absolutely a defense first 2B, but the Royals could really use an offensive boost from the MI. If Ellis's option is picked up, expect it's because the Royals have identified offensive help elsewhere. Forecast: There should be a couple strong 2B candidates on the market this winter. Expect the Royals to cut ties with Ellis and try to upgrade if the market presents itself. 3B: Kevin Kouzmanoff (Option), Jesus Guzman - Kouzmanoff has thrived in Kansas City since coming over from the Yankees. However, his RL stats are horrendous this year. Guzman may not receive a rating at 3B next year, and shouldn't be counted on to start even if he does. Forecast: Expect this to be one of the two or three main focuses for the Royals in offseason talks. This would be a good position to add a veteran player. SS: None - Forecast: Well that's just depressing...or is it? There should be a few SS on the market this year that draw the interest of many teams. The Royals will be involved in talks with all of them. SS has been a black hole offensively and slightly above average defensively this year. Expect that to change in the offseason. LF: Melky Cabrera, Logan Morrison, Jesus Guzman - Cabrera has had a rough first year sim with the Royals, but should fare much better next year (thank goodness steroids and being an idiot in RL don't hurt sim leagues). Morrison should just leave his glove at home when it comes to LF, and Guzman is a serviceable backup if Cabrera should go down with an injury. Forecast: Cabrera is the starting LF for your 2013 Kansas City Royals. CF/RF: Brett Jackson, Ezequiel Carrera, Jesus Guzman (RF), Brandon Guyer, Tim Wheeler - CF and RF will come down to defensive projections for the Royals unless one of Brandon Guyer or Tim Wheeler have a huge spring. Carrera has provided surprisingly consistent offense in nearly 300 ABs in 2012 and has patrolled CF very well. Jackson, after being moved to RF, has seen his defense suffer a little. Liriano, while a very exciting prospect for the Royals, is not going to be rushed through the system and should not factor into the 2013 plans. Again, Guzman provides an adequate backup option in RF. Forecast: Jackson and Carrera (assuming he gets a rating at all) will round out the OF in Kansas City for 2013. Defensive ability will dictate who plays where. C: David Ross, Tony Sanchez Forecast: No need to even speculate here. Ross is the starter in 2013. The only speculation is to whether Sanchez will be pushed into backup duty to save the Royals half a million dollars or whether a league minimum backup option will be signed. Starting Rotation: Tim Lincecum, Madison Bumgarner, Matt Harrison, Mike Minor, Felix Doubront, Rick Porcello, Rich Harden, Aroldis Chapman The Royals have great pitching depth going into 2013. Mike Minor has had an outstanding second half in the sim as well as RL and his projection will be key moving forward. Doubront took big steps forward this year in RL and Porcello improved off his exciting 2011 campaign in RL. What this means is that Harden is likely the odd man out and will be moved to swingman duties in the bullpen again. Chapman is really the wildcard. Will ZiPS give him a SP rating again? If so, he could be dominant. My guess is that he'll get a RP only rating for 2013, though, moving him to possible closing duties. Forecast: Lincecum is the Ace, Bumgarner and Harrison are 2-3, and one of Minor, Doubront, and Porcello are sent back to AAA. The Royals could use their depth here to trade for offensive help or more draft picks in 2013, but without speculating to that, this is the likely scenario. Bullpen: Aroldis Chapman, Rafael Soriano, Darren O'Day, Ernesto Frieri, Jeremy Affeldt, Matt Capps, Rich Harden, JC Ramirez Soriano was the big splash made in FA by the Royals this past year, and he's done well in a less than pressure situation this year. 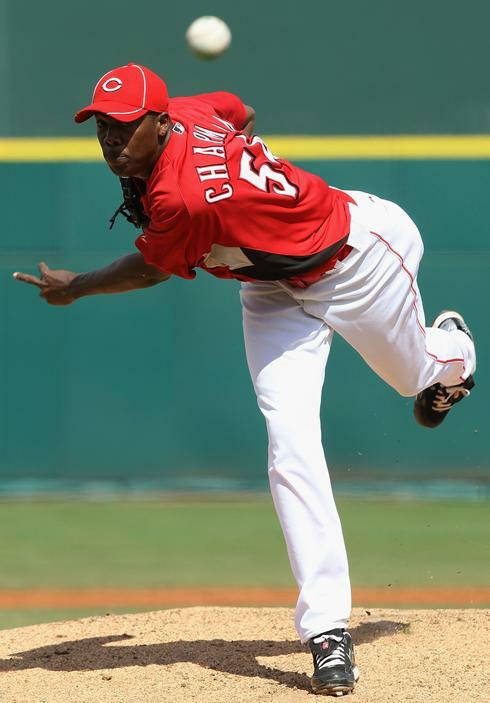 The emergence of Chapman as a dominant closer in RL may give the back end of the Royals bullpen a real bump next year. Will they move Soriano...will the move Chapman...will they employ a closer by committee plan? Forecast: Chapman and Soriano split closing duties vs. RH/LH, O'Day, Frieri, and Affeldt get the Royals from starter to closer, Capps is the mop up guy, Harden is your swingman, and despite his move to the bullpen in the minors with success, Ramirez gets one more year in AAA. Prospects: The Royals don't have much in the minors that is ready to go, which isn't a large concern considering the huge number of rookies who played this year. Candidates to make the roster include Tim Wheeler, Brandon Guyer, Tony Sanchez, JC Ramirez, and Felix Doubront. Rick Porcello will be a 2nd year player if he makes the rotation out of Spring Training. A closer look into the RL stats of Royals players presents an interesting scenario moving forward. While there is a great deal of youth on the pitching staff, four out of our top six starters had seasons that were not as good as their projections for 2012. Matt Harrison looks to be the clear ace of the staff heading into 2013, but there is not the clear "Big Three" that the front office hoped there would be in Bumgarner, Harrison, and Lincecum. There is still reason to believe that four of the five Royal starters will project above league average, but moving forward there is absolutely reason to believe that the Royals will look to upgrade the top half of the starting rotation, if possible, while continuing to keep an eye on the future. The Royals bullpen, on the other hand, can not be set up any better for success. Every pitcher who played in 2012 exceeded projections. Bullpens are wildly erratic over the course of multiple seasons, but the Royals are absolutely set up to finish games with the best of the league in 2013. This could be an area where we look to trade from strength, though many teams do not value Relievers in the same way as other players. The starting lineup for KC in 2013 remains largely in tact in the early off-season report, with only SS and 3B to figure out. The bench will need some re-tooling, but there is nothing there that's out of the ordinary. Of the remaining offensive players on the roster from 2012, all but Gamel, Jackson, and Morrison enjoyed seasons that out-performed their projections. Gamel was injured for all but the beginning of the season, Morrison played through injury and ultimately succumbed to knee surgery, and Jackson was only playing with the big club for the last month or so of the season. It will be interesting to see how the projections treat those three, specifically, as well as Melky Cabrera, moving forward. The farm will take a step back in overall rankings, as several players performed below expectations in 2012. An in depth look at the farm is coming soon! That's quite a bullpen. I wouldn't want to fall behind the Royals next year. If I can't find some real offense somewhere, that may not be a problem for anyone! The Royals farm system will take a hit in the rankings this year as 6 players from last year's top 10 graduated to the big leagues during the season. The draft proved to replenish the offensive portion of the system, but left the pitching side a bit high and dry. Rymer Liriano is the blue chip hitting prospect in the system. He's doing very well in an extremely small sample size in the AFL. Delino DeShields, Jr. is beginning to get some love as well, though we believe Rougned Odor to be the better overall prospect at this point. Robert Stephenson has become the pitcher that the Royals scouting department will hang their hat on. After 1/2 a minor league season, Sickels has already placed him among the top 20 pitching prospects in baseball. Felix Doubront is ranked higher only because he's already proven himself to be a back end of the rotation starter in the big leagues in RL. After that, the system takes a small dip to Blake Swihart. Hopefully he can rebound next year, as the ceiling is still very high for him. Karsten Whitson rounds out the pitching side of the minors. Hopefully he proves to be a fast moving draft pick next year. Sanchez held his own in his first go of AAA, but his prospect star has dimmed to the point that we hope he's able to be a solid backup capable of starting 20-25 games per year. Suarez and Kelly are rated as B- prospects right now. If Suarez's bat hangs in A+/AA, that will change significantly, as the glove absolutely plays. Right now, there aren't a lot of analysts out there who trust that will happen, though. Kelly's rating is very fluid, with nearly zero data to back it up. All in all, I would expect the Royals minor league system to rank somewhere around 15 in DMBO. Given the amount of talent to graduate, this isn't surprising. The main positive from our perspective in the front office is the hitting/pitching balance that the system now contains. Moving forward, it is our hope to continue to address adding high end talent to the system as well as continuing to have a strong balance of hitting/pitching prospects from which to build the team through promotion or trade. I, personally, have a love hate relationship with The Scouting Book Prospect Rankings. I love them because they are my go to site to see across the board rankings. Under every player I can find how TSB, BA, MiLB, Scout, Sporting News, and Baseball Prospectus rank an individual player. However, I find them to be tedious simply because they rank over 400 players and move them fluidly, which, as you can imagine, leads to a lot of mobility in players...especially those below the 150 mark. While I understand their process, I feel as though it can - at times - cause knee jerk reactions to a performance (performances?) rather than the overall projection of the player's talent. It also leads to a lot of changes as BA/BP/MiLB/etc. release their lists. With that being said, here's how the Royals farm system stacks up from The Scouting Book before any other groups release their list. It is interesting how much love Jed Bradley is getting despite his absolutely abysmal 2012 campaign. He's definitely young enough to turn it around, and this shows me he probably should have been included in my Top 10...but some of those peripherals are ugly from last year. Hopefully I'm wrong and they are right! I can't see any reason that Bobby Borchering is anywhere near the top 100 other than he hits home runs...if he can make contact. He needs to adapt to AA, and soon, in my opinion. His first go around was ugly at best. Catchers with offensive prowess are hard to find, but Swihart is getting lots of love as well. He put up respectable numbers in 2012, and going forward should be given an opportunity to show growth, but there are players behind him on the list (and younger) who've put up better numbers at the same or higher levels recently. I probably cooled a bit on Tim Wheeler due to his injury issues this year. All he did was hit .300 in his first taste of AAA when he was healthy. If he doesn't crack the Colorado roster next year, he'll be a tad old to be considered a true prospect, but he can likely provide bench depth and MAYBE be a platoon player moving forward. He's probably ranked a bit high at The Scouting Book and definitely ranked too low by me. At least in my opinion, they often are a year or more behind when evaluating players. So Jed Bradley is only that high because no one bothered to update the list and drop him way down where he belongs, is my guess.